ABBEY NUNS coach Jack Reynolds insisted there were plenty of positives to take into the new season despite watching his side slip to a pre-season defeat, writes Fiona Tomas. The Nuns travelled to Barnes on Saturday where they faced an experienced Hammersmith and Fulham side before starting life in Championship South. 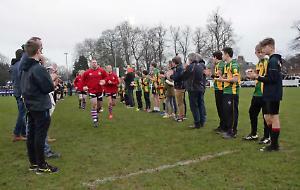 The Sonning-based side succumbed to a 27-21 loss in a match played across four quarters, allowing Reynolds — accompanied by second team coach Lewis Jones — to experiment with a mixture of first-team stalwarts and development players. It was the London outfit who showed the initiative from the start, snuffing any possibility of an Abbey attack by pressing with their high defensive line. It meant Abbey were pinned in their own half for the first quarter, before the hosts went ahead with two unconverted tries, the second of which saw them capitalise from a line-out. But two unanswered tries from Annette Tomas in the second put Abbey back in contention. The first saw the pacey full-back blitz through the midfield before angling down the right to score under the posts, before sprinting the length of the pitch for her second. There were some fine individual performances from Abbey’s hard-working forward pack, notably with Meg Fowler, Annabel Hawkins and Hollie King were driving forward tirelessly, while Pippa Robinson proved a constant threat in Abbey’s finely-tuned line-out. Tomas rounded off a successful second period for the Nuns by grabbing her hat-trick in a well-worked move. After several passages of forward play, it was scrum-half Ellie Rice who spotted space out wide and quick hands found winger Gabriella Millard, who stormed down her left flank before intelligently offloading to the oncoming Tomas for an easy run-in. Alice Denton was on duty to convert all three from the tee. But Hammersmith and Fulham showed their credentials, fighting back in the third and fourth quarters with three unanswered tries, despite some good scrums and hits from Fiona Manning and Jo Brind. Reynolds was encouraged by many individual performances and said the game was a building block for the first team’s season opener against Henley in the RFU’s second tier of women’s rugby next week. Reynolds said: “We went into this match not caring about the result, but looking for a performance. I thought everyone on that pitch stepped up today and there are so many positives we can take.